Over the last week, more than 2,000 Rice students, faculty and staff signed up to help rebuild the city we all call home through the Rice Harvey Action Team collaborative. They have volunteered nearly 8,000 hours, waking up before the sun rises and working long after it goes down. The Rice community’s sense of civic duty has been inspiring to everyone; however, we can and should ask more of each other. I am writing this because I was once a confused and concerned member of the Rice student body, wondering what I could possibly do to help the social injustice happening both in my city but also hundreds of miles away — like in Charlottesville. The 2013 bombings did not rob the city of its spirit. It reinforced what it meant to be a Bostonian, and it ignited a sense of pride and togetherness that we never truly had before. If the heroic efforts of Houstonians are any indication, Harvey will do the same to Houston. Yes, it will take time to rebuild and heal. But when that happens — and believe me, it will — Houston will be stronger than ever before. In your face, Harvey. We’ve come to the role of editor-in-chief through different paths — Drew as a news writer and editor, Juan as the paper’s business manager and a sports writer — but we share a common goal. From documenting day-to-day student life to investigating the most serious issues on our campus, we seek to provide an unbiased lens into the Rice community. This year we are reminded once more that we don’t live in a bubble here at Rice, and that external events — good and bad — have an impact on our community. On Monday morning, I sent a letter to the campus community conveying some thoughts on the outrageous and tragic events in Charlottesville. I placed it in the context of our own values, and the importance of both our commitment to those values, and for taking responsibility for living those values. For those of you who aren't familiar with the SA, we are the campus-wide student government organization that collaborates with students, administrators and the colleges to represent your interests to the faculty, administration and external organizations. Our mission is to enrich the undergraduate experience by engaging, inspiring and advocating for all Rice undergraduate students. This May, 62 percent of ExxonMobil shareholders voted in favor of the company reporting the impacts of climate change on its business. In 2016, shareholders of Fluor, a major global engineering firm with over $19 billion in annual revenue, voted to require the company to formally report all of its political contributions. Yet, due to the $5 billion Rice University endowment’s sole focus on investment-picking, had it been an investor in either of these companies, it would have abstained from these votes, a de facto vote against these proxy resolutions for positive social change. While I applaud the Student Association’s efforts to “encourage engagement beyond the hedges,” providing full access to The New York Times for free may not be the best way to effect change on the levels of student engagement with the wider world. Rice University is in a great position to lead by becoming the first university in Texas, and one of the first in the South, to offer scholarships to displaced Syrian students. What Rice is showing me these days is that it does not care about art. Perhaps Rice University would be well served by being reminded of its own crest: Letters, science, art. We were very disappointed to read the WomenLEAD winning essay featured in the April 19 edition of the Thresher. The author opens with her remorse about being unable to attend the Women’s March, but realizes that by not marching and preparing herself for a leadership position, she is marching in her own way. On Easter Sunday, an email went out to the Sid Richardson College listserv from our Chief Justice announcing our traditional end-of-the-year party, Hi-Liter, was effectively canceled. As Rice students, we pride ourselves on being a part of such a diverse population. We have multiple forums via which we can have meaningful conversations surrounding sensitive topics. 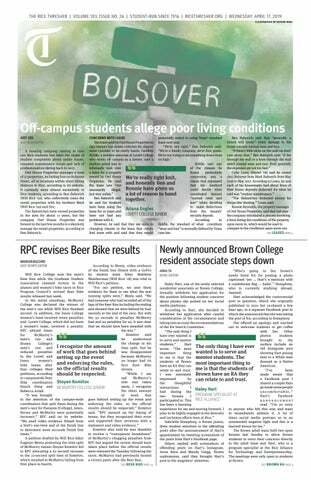 In last week’s edition of the Thresher, the outgoing Hanszen Beer Bike college coordinators wrote an op-ed regarding the Beer Bike fine system. Time and time again, Rice students have been described as “politically apathetic,” prone to ignoring the current events of our day in favor of schoolwork, research and other activities encompassed in that impermeable bubble of academics. Jan. 21, 2017 marked the largest single-day protest in U.S. history. Countless women swarmed our nation’s capital to stand in solidarity. Whatever happens, the Student Association is great and so are all of you. Last week, the Thresher deemed my Facebook post announcing my decision to write-in to the Student Association presidential election “breaking news.” I have never been breaking news before and I highly doubt I will be again. As a rather tumultuous election period is wrapping up, I want to clarify what caused the constitutional errors that resulted in the exclusion of part-time students from our initial ballot and how we have responded over the past week. When I first heard about the proposal to lower the number of distribution classes required, my gut reaction was somewhere along the lines of a primal scream. During this campaign, I’ve focused on the issues. It’s no secret there has been a spirited debate regarding the candidates’ proposals to make Rice a better place. However, over the past day that debate has extended into unfounded vitriol directed at me from both Justin Onwenu’s allies and his own campaign, including an op-ed by a Student Association senator claiming I was failing to stand up for Title IX complainants, and Justin’s condescending remarks that “leadership is hard” and “using buzzwords to rile up students for votes is easy.” Instead of resorting to personal attacks against Justin, I’d like to have a frank discussion about his policies. Justin, simply discussing sexual assault prevention isn’t bold enough.